Dinosaur Facts & Dinnosaur Species? In 1809, part of an Iguanodon's giant shinbone was found in southern England. In 1819, some teeth and other bones were discovered and scientists at the time thought that they probably belonged to a gigantic mammal, like a rhinoceros. But then the geologist Gideon Mantell noticed that the teeth resembled those of a modern iguana, so he named the creature Iguanodon. Iguanodon was the second dinosaur to be discovered even though the word "dinosaur" had yet to be coined. Iguanodon stood about 16 feet tall, measured 30 feet long and weighed close to five tons. It roamed the warm, humid Cretaceous landscape and fed on the rich abundance of plant life covering the land. Large numbers of Iguanodon skeletons have been found in England, Belgium and Germany, indicating to paleontologists that Iguanodon probably traveled in large herds. 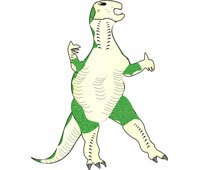 Iguanodon had small "hooves" on its hands and feet, and its legs were long and sturdy. This giant dinosaur could have stood on its back legs to reach for higher bushes and plant life.